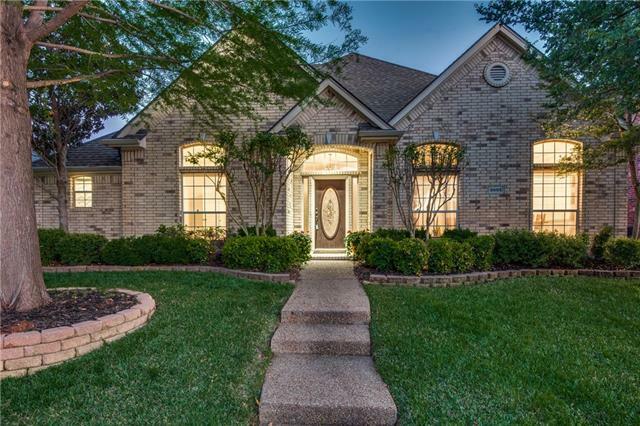 All Legend Crest Ph V homes currently listed for sale in The Colony as of 04/21/2019 are shown below. You can change the search criteria at any time by pressing the 'Change Search' button below. "Gorgeous updated Multi-generational 1.5 story home located in the well-established neighborhood of Legend Crest! From the time you enter this light & bright split flrplan you will feel the warmth of home . With two Master Bdrms, one up and one down, you have space for everyone. Color tones & architectural details are delightful. Updates include: 2019-waterproof, scratch resistant bamboo flring, carpet installed, lighting fixtures, stamped Concrete Patio, & blown in Insulation,2016-roof, up "
"Well-maintained single story 4 bedroom, 3 bath home on a corner lot in sought after Legend Crest. Family room with a gas fireplace and a wall of windows overlooks the covered patio and fenced in backyard. This home has an eat in kitchen, breakfast bar, stainless appliances, and gas cooktop. Formal dining room is across from a nice sized study - both have large windows and lots of natural light. Master has a bay window and updated walk in shower and tub. Jack and Jill bath compliments 2 addition"
"Beautiful 4 bedroom 3 full baths with a jack and jill. Walk-in entrance to a formal dining room on the right and formal living room next to the entrance which can also be used as a beautiful office. The formal dining room has an entrance directly into the kitchen which has an eat in breakfast area next to a built in study. It also as a barstool height counter-top overlooking the kitchen area and family room. The family room is spacious with a wood burning fireplace looking out the large back yar"